Picture yourself behind the joysticks of one of the world's finest compact radius excavators, the Cat® 325F L. This machine features a highly efficient U.S. EPA Tier 4 Final/EU Stage IV C4.4 engine that's miserly on fuel paired with a state-of-the-art hydraulic system that's responsive to your every command. Less Fuel with advanced engine technology and sytem control. more lift capacity with larger counterweight. Compact radius design helps you work in tight places. • The Cat C4.4 ACERT Tier 4 Final/Stage IV engine burns up to 22% less fuel than the Tier 3/Stage IIIA engine it replaces, and it can run on biodiesel up to B20. • Maximum lift is 12 650 kg at 4.5 m out front at ground level – up to 8% more lift than the model it replaces. • High-ambient cooling capability lets you work in extreme heat. • The machine can work in altitude up 3000 m with no engine derating. 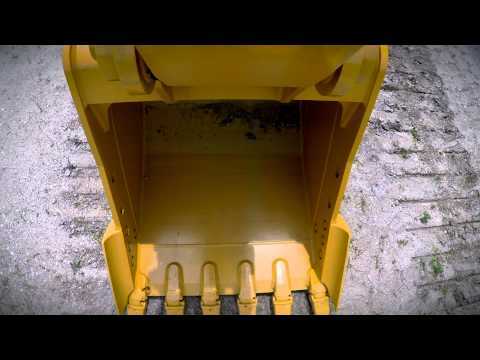 • Compact radius helps you work in tight spaces. 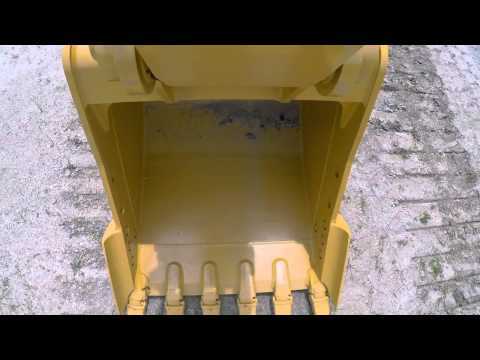 • Demolition work is easy with a Cat hammer, grapple, shear, or multi-processor. 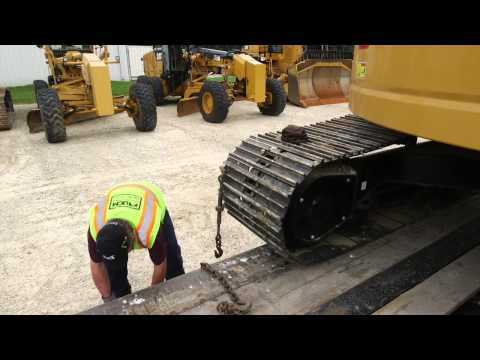 • Utility and finishing work are fast and flawless with a Cat compactor, thumb, finishing bucket or tilt bucket. • Couplers let you swap between attachments in seconds without leaving the cab. • See the whole attachment line for your machine at www.cat.com/attachments. • The full-size roll-over protective structure (ROPS) certified cab is quiet and comfortable. • Automatic climate control helps maintain consistent cab temperature. • Joystick consoles and armrests are adjustable. • Fully adjustable air suspension seat maximizes comfort levels during long periods of operation. • The LCD monitor is easy to navigate and programmable in 44 languages. • Standard rearview camera and right side cameras enhance visibility. 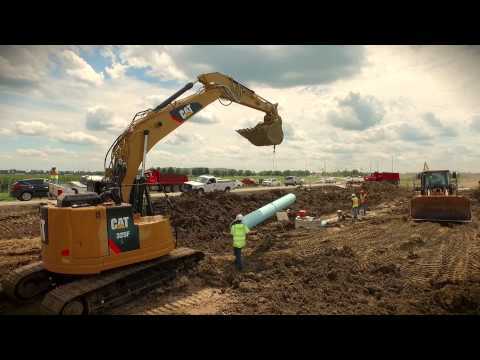 • Cat Grade Control Depth and Slope helps operators work more productively and accurately with less rework. • Product Link™/VisionLink® connects owners to their equipment, providing access to machine location, hours, fuel consumption, idle time, events, and diagnostic codes. • Most routine service points are at ground level. • Filters are consolidated in the pump compartment for added convenience. • Wide service doors and a two-piece engine hood with gas cylinder assist allow for easy access. • An electric fuel priming pump speeds up starts and fuel system maintenance. • The roll-over protective structure (ROPS) cab is safe, comfortable, and as quiet as today's top on-road trucks. • Handrails, anti-skid plating, and countersunk bolts reduce slipping and tripping. • Four mirrors, a rearview and a side view camera enhance visibility to help make operators more effective and efficient. • A full-length firewall separates the pump and engine compartments. • A ground-level fuel cutoff switch shuts down the engine in case of emergency. Take a look at the 325F side by side with other models. Browse through these photos and videos for a closer look at the 325F and what it can do for your operation. Wherever you want to go from here, the 325F is ready. You can get in touch with us in a variety of ways. Check out our inventory of new, rental and used equipment. Connect with your local dealer, ask our experts for advice or read what's happening in the customer forums.